Many machine learning algorithms make assumptions about your data. It is often a very good idea to prepare your data in such way to best expose the structure of the problem to the machine learning algorithms that you intend to use. 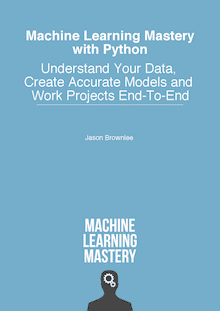 In this post you will discover how to prepare your data for machine learning in Python using scikit-learn. Photo by Vinoth Chandar, some rights reserved. You almost always need to preprocess your data. It is a required step. A difficulty is that different algorithms make different assumptions about your data and may require different transforms. Further, when you follow all of the rules and prepare your data, sometimes algorithms can deliver better results without the preprocessing. Generally, I would recommend creating many different views and transforms of your data, then exercise a handful of algorithms on each view of your dataset. This will help you to flush out which data transforms might be better at exposing the structure of your problem in general. This section lists 4 different data preprocessing recipes for machine learning. All of the recipes were designed to be complete and standalone. You can copy and paste them directly into your project and start working. The Pima Indian diabetes dataset is used in each recipe. This is a binary classification problem where all of the attributes are numeric and have different scales. It is a great example of dataset that can benefit from pre-processing. You can learn more about this data set on the UCI Machine Learning Repository webpage (update: download from here). Load the dataset from a URL. Split the dataset into the input and output variables for machine learning. Apply a preprocessing transform to the input variables. Summarize the data to show the change. The transforms are calculated in such a way that they can be applied to your training data and any samples of data you may have in the future. The scikit-learn documentation has some information on how to use various different preprocessing methods. You can review the preprocess API in scikit-learn here. When your data is comprised of attributes with varying scales, many machine learning algorithms can benefit from rescaling the attributes to all have the same scale. Often this is referred to as normalization and attributes are often rescaled into the range between 0 and 1. This is useful for optimization algorithms in used in the core of machine learning algorithms like gradient descent. It is also useful for algorithms that weight inputs like regression and neural networks and algorithms that use distance measures like K-Nearest Neighbors. You can rescale your data using scikit-learn using the MinMaxScaler class. After rescaling you can see that all of the values are in the range between 0 and 1. Standardization is a useful technique to transform attributes with a Gaussian distribution and differing means and standard deviations to a standard Gaussian distribution with a mean of 0 and a standard deviation of 1. It is most suitable for techniques that assume a Gaussian distribution in the input variables and work better with rescaled data, such as linear regression, logistic regression and linear discriminate analysis. You can standardize data using scikit-learn with the StandardScaler class. The values for each attribute now have a mean value of 0 and a standard deviation of 1. Normalizing in scikit-learn refers to rescaling each observation (row) to have a length of 1 (called a unit norm in linear algebra). This preprocessing can be useful for sparse datasets (lots of zeros) with attributes of varying scales when using algorithms that weight input values such as neural networks and algorithms that use distance measures such as K-Nearest Neighbors. You can normalize data in Python with scikit-learn using the Normalizer class. The rows are normalized to length 1. You can transform your data using a binary threshold. All values above the threshold are marked 1 and all equal to or below are marked as 0. This is called binarizing your data or threshold your data. It can be useful when you have probabilities that you want to make crisp values. It is also useful when feature engineering and you want to add new features that indicate something meaningful. You can create new binary attributes in Python using scikit-learn with the Binarizer class. You can see that all values equal or less than 0 are marked 0 and all of those above 0 are marked 1. In this post you discovered how you can prepare your data for machine learning in Python using scikit-learn. Your action step for this post is to type or copy-and-paste each recipe and get familiar with data preprocesing in scikit-learn. Do you have any questions about data preprocessing in Python or this post? Ask in the comments and I will do my best to answer. On Normalizing, do you need to do this if you are planning on using euclidean, or cosine distance measures to find similar items in a dataframe? e.g. you have a vector where each column has some attributes about the product, and you want to find other products that have similar attributes. Thanks for the post and the website overall. It really explains a lot. I have a question regarding preparing the data ,if I am to normalize my Input data, does the precision of the values have an effect ? Will it make the weight matrix more sparse while training with higher precision if the training data is not very high? In that case should I be limiting the precision depending on the amount of training data? I am interested in sequence classification for EEG, In my case I intend to try out RNN . I was planning on normalizing the data since I wish the scaling to be performed on each individual input sequence. Hoping to hear from you,thanks ! I don’t have a clear answer for you. It may. I have not seen it have an effect, but I would not rule it out. If you’re worried, I would recommend testing with samples of your data at different precisions and different transforms and evaluate the effect. I expect the configuration of your model will be a much larger leaver on performance. Hi Jason,Thank you for the reply. I intend to build an RNN from scratch for the application similar to sentiment analysis (Many to one). I am a bit confused about the final stage. while training, when I feed a single sequence(belong to one of the class) to the training set , do I apply softmax to the last output of the network alone and compute the loss and leave the rest unattended? Where exactly is the many to “ONE” represented? Sorry Akshay, I don’t have example of implementing an RNN from scratch. My advice would be to peek into the source code for standard deep learning library like Keras. Should one normalize the test and train datasets separately? or does he have to normalize the whole dataset, before splitting it? Yes. Normalize the train dataset and use the min/max from train to normalize the test set. In this case, min/max of test set might be smaller or bigger than min/max of the training set. If they are, would it cause a problem to the validation? You should estimate them using domain knowledge if possible, otherwise, estimate from train and clip test data if they exceed the known bounds. Hi Jason, I often read about people normalize on the input features, but not on output, why? BTW, it is for a regression problem. You can normalize the output variable in regression too, but you will need to reverse the scaling of predictions in order to make use of them or quote error scores in a meaningful way (e.g. meaningful to your problem). The MSE loss is very high (1e8) when I didn’t applied normalization on the output variable, and small MSE loss (0.0xxx) when I applied normalization. Is there something wrong in my implementation? Should I run large epochs(maybe 50000?) when the output variable isn’t normalized? (currently running 500 epochs with normalization). Perhaps. Continue to try different things and see if you can learn more about your system/problem. Normalizing input variables is an intent to make the underlying relationship between input and output variables easier to model. I have converted rescaledX to a dataframe and plotted histogram for rescaling, standardization and normalization. They all seem to be scaling down the magnitude of an attribute to a small range — 0 to 1 in case of rescaling and normalization. – are they doing similar transformation i.e. scaling down attributes so they become comparable? – do you only apply one method in any given situation? – which would be appropriate in which situation? The best advice is to try a suite of transforms and see what results in the more predictive model. I have a few posts on power transforms like log and boxcox, try the search feature. if we want to apply this algorithm on mixed data set (numeric and nominal). EX (23,125,75,black,green) this data presents the age ,length,weight ,Hair color, Eye color Respectively. For numeric attributes we will normalize the data to be in the same range. Do we need to transform nominal attributes to binary attributes? I would recommend either using an integer encoding or a one hot encoding. It is common to use a one hot encoding. I have many posts on the topic. I have a question (maybe is almost the same that Dimos). Any process used to prepare data for training the model must be performed when making predictions on new data with the final model. This means coefficients used in scaling (e.g. min/max) are really part of the model and must be chosen mindfully. I am applying normalization for network attacker data. i used min/max normalization. but in the real data there is some features have a large values. if i want to apply standard deviation normalization. should i apply only one normalization type? or can i apply min/max for all data and then apply standard deviation for all data. what is the sequence and is it wrong if i apply standard deviation normalization only on the large value features? I would recommend trying both approaches and see what works best for your data and models. I don’t understand the two comands. This is called array slicing, I will have a post on this topic on the blog tomorrow. Here, we are selecting the columns 0-7 for input and 8 for output. Dear Dr. Jason Brownlee, i have prepared my own dataset on hand writing from different people, and i prepared the images in 28X28 pixel so the problem is how i am going to prepare the training and testing data set so as i will then write the code to recognize the data? my idea is can you help me how i have to do that? and how i have to read my images data set and training data set using tensorflow? That is a great link that shows how to use the existing CIFAR-10, thank you for that, but as i tried to mention it above, i have handwritten images prepared in 28×28 pixels, so how i have to prepare the training set (how to label my dataset)? it can be .csv or .txt file, i need the way how i have to prepare training set and access in tensorflow like MNIST? The images will be standard image formats like jpg or png, the labels will be in a csv file, perhaps associated with each filename. Hi Jason. First of all, great work with the tutorials. Here’s something I don’t understand though. What’s the difference between rescaling data and normalizing data? It seems like they’re both making sure that all values are between 0 and 1 ? Normalizing is a type of rescaling. Hello Sir!! I am planning a research work which is about music genera classification. My work includes preparing the dataset for the type of music I want to use as there are no public dataset for those music. My problem is I don’t know how to prepare music dataset. I have red a lot about spectrogram. But, what are the best mechanisms to prepare music dataset? Is it only spectrogram I have to use or I have alternate choices? Sorry, I cannot help you with music datasets. I hope to cover the topic in the future. Sorry, the standard scalar is not for scaling images. so, to improve the performance of training images, which scale method we should use? Or, just divide train set to a value, for example, train_x/255, …? Try a suite of transforms and see what works best for your data. Hi Jason, thanks for your posts. I have a question about data preprocessing. Can we have multiple inputs with different shape? for example two different files, one including bit vectors, one including matrixes? If so, how can we use them for ML algorithms? Basically, I want to add additional information to data, so classifier can use for better prediction. For most algorithms the input data must be reshaped and padded to be homogeneous. Thanks for your response. Yes, I understand that. This extra information is like a metadata that gives information about the structure that generates the data. Therefore, it is a separate type that gives mores information about the system. Is there any way to apply it to ML algorithms? Sure, perhaps you could use a multiple input model or an ensemble of models. Do you have any link/reference suggestion that I can read more about it? I could not find a good resource yet. Thanks in advance. What is Y used for? I realize the comment and description say it’s the output column, but after slicing the ‘class’ column to it, I’m not seeing Y used for anything in the four examples. Commenting it out does not seem to have any effect. Is it just a placeholder for later? If so, why did we assign ‘class’ data to it instead of creating an empty array? We are not preparing the class variable in these examples. It is needed during modeling. Thanks for great article. I would like to ask a question regarding using simple nearest neighbors algorithm from scikit learn library with standard settings. I have a list of data columns from salesforce leads table giving few metrics for total time spent on page, total emails opened, as well as alphabetical values such as – source of the lead with values signup, contact us etc., as well as country of origin information. So far I have transformed all non-numerical data to numerical form in the simple way 0, 1, 2, 3, 4 for each unique value. With this approach scoring accuracy seams to reach 70% at its best. Now I want to go one step further and either normalize or standardize the data set, but can’t really decide which route to take. So far I have decided to go with safest advice and standardize all data. But then I have worries about some scenarios, for example certain fields will have long ranges of data, i.e. those representing each country, or those that show number of emails sent. On another hands other fields like source, will have numerical values 0, 1, 2, 3 and no more, but the field itself does have very high correlation to the outcome of winning lead or loosing lead. I would be very grateful if you could point me to the right direction and perhaps without too much diving into small details, what would be the common sense approach. Also, is it possible to use both methods for data set, i.e. standardize data first, and then normalize. The data preparation methods must scale with the data. Perhaps for counts you can estimate the largest possible/reasonable count that you can use to normalize the count by, or perhaps invert the count, e.g. 1/n. Hi @jason can you please tell why normalizer result and rescaling (0-1) results are different. isn’t there a standard way of doing so which should give the same result irrespective of the class used (i.e MinMaxScaler or normalizer). I don’t follow, sorry. Can you give more context? Hi Sír. I have a housing datasets whose target variable is a positively skewed distribution. So far that’s the only variable I have seen to be skewed although I think there will be more. Now I have read that there is need to make this distribution approximately a normal distribution using log transformation. But the challenge I’m facing right now is how to perform log transformation on the price feature in the housing dataset. I’d like to if there is a scikit-learn library for this and if not how should I go about it? More so I plan on using linear regression to predict housing prices for this dataset. I am using MinMaxScaler preprocessing technique to normalize my data. I have data of 200 patients, where each patient data for single electrode is 20 seconds i.e. 10240 sample.Then, the dimension of my data is 200*10240. I want to rescale my data row-wise but MinMaxScaler scale the data column wise which may not be correct for my data as i want to rescale my data accordingly 1*10240. What changes are required in order to operate row wise independently of other electrode? In general, each column of data represents a separate feature that may have a different scale or units from other columns. For this reason, it is good practice to scale data column-wise. I have colleted 1000 tweets on demonetization. Then i am extracting different features like pos based, lexiocn based fetaures, morphological features, ngram features.So different feature vectors are created for each type and then they are stacked column wise. I have divided dataset of 1000 tweets into 80% as training and 20% as testing. I have trained svm classifier but accuracy is not more than 60%. How should i improve accuracy or which feature selection should i need to use? Big Question is for me. Why should we use random values for weight and Bias value? Neural nets use random initial values for the weights. This is by design. It allows the learning algorithn (batch/mini-batch/stochastic gradient descent) to explore the weight space from a different starting point each time the model is evaluated, removing bias in the training process. Y = array[:,8] I have doubt here X is only 0 to right feature and Y is target 8th column right . Confirm it by inspecting the data, it is correct. Thank you so much for all of your help – I have learned a ton from all of your posts! I have a project where I have 54 input variables, and 8 output variables. I have decent results from what I have learned from you. However, I have standardized all my input variables, and I think I could achieve better performance if I only standardize some of them. Meaning, 5 of the input columns are the same variable type as the outputs, I think it would be better not to scaler this. Additionally, I one of the inputs in the month of the year – I do not think that that needs to be standardized either. Does my thought process to do selective preprocessing make any sense? Is it possible to do this? Perhaps. I would recommend designing and running careful experiments to test your idea. Let the results guide you rather than “best practice”. Really helpful article. I tried to access the Pima Indian diabetes dataset and it’s no longer available to download at the link provided due to permission restrictions. Note that I provided an alternate link in the post. I have n-dimensional binary data. Suggest some good classifier for binary data-set. Try a suite of methods and see what works best for your specific dataset. Hello Jason, I follow your posts very closely as I am studying machine learning on my own. With respect to scaling/normalizing data, I always have a dilemma. When do I use what? Is there any way to know beforehand which regression/classification models will benefit from scaling or normalizing data? For which models its not required to scale or normalize data? Thank you for this post. It was very helpful. I have a question on the normalization/standardization approach,when the dataset contains both numeric and categorical features. I am converting the categorical features into dummy values (contains 0 or 1). Should the numeric features be standardized along with the dummy variables? or, 2) Should the numeric features be only be standardized? No need to scale dummy variables. It’s fine with the dataset from sklearn. But once I use pandas.read_csv to load the iris dataset from a url and then run the code, it just gives me tons of angry text. If I were to use pandas.read_csv, how should I format and store the data such that the aforementioned scipy code would work? Thank you so much! Hi! Jason , thanks for the great tutorial. i have a question, would like to hear from you. [ X – min(X) ]/( [max(X) – min(X) ] ). by using this formulae when i am trying to compute the normalised data the answer i am getting is different from that obtained by the Normalizer class. Why is it so. Normalizer is normalizing the vector length I believe. Use the MinMax scaler instead. I am a new learner with Python ,your comments are of great help Jason . May you guide how i can comment on class distribution whether ot is balanced or unbalanced and can print the total number of 1’s and 0’s in the training and testing data. your articles are awesome, thank you very much I am subscribed for forever. I have a question after scaling the input for my regression model and created the model I need to scale again my input data when I use this ckpt file, how can I pass this scaling to the place where I will use the model? Via the TF session? But it gives me output [[0,0,0,0,0,]] and because of that I cannot predict anything with the model object. Can you tell me where I am making mistake? I’m not sure I follow the question, sorry. What are you trying to do? I am making a model using TensorFlow and before batching the data for training I am scaling it using StandardScaler. After my model is created I want to restore the checkpoint and make a prediction, but the data that I am inputting is not scaled. So my question is how to scale the same way the data when restoring a model? Because when I am training the data I am scaling among all the data, the whole data.csv file but later when restoring the model my input is a single sample. I hope is more clear now. You must save the scaler as well, or the coefficients used by the scaler. Can you show me an example? I have done this serializing in using pickle and then using it again but does not look like the most pretty option. I think I have some examples of saving scalers and tokenizers with some of the NLP tutorials. I am preprocessing CIFAR-10 data by the sklearn StandardScaler(copy = False, with_mean = True, with_std= True). Then I am doing dimensionality reduction by pca followed by lda on the principal components. The problem is that if I do dimensionality reduction without preprocessing everything works fine, however if I do so after preprocessing I am getting “Memory Error”. I am using svd solver for pca and and eigen solver with auto shrinkage for lda(linear discriminants). Do you have any idea about what might be the cause of this problem? ** I tried min max scaling without calling the library function. Even then I am getting the same error. No idea, sorry. Perhaps post your code and error to stackoverflow? Is it possible I can send you my currently ongoing papers for review once it is finished. Sorry, I don’t have the capacity to review your paper. Great article! Do you have insights can multiple scalers/normalizers be used consequently? I mean applying them after each other to the original dataset. Is there any ways to report ML result set via mails? You can write code to send emails, but that is an engineering question, not machine learning. In ANN, the input data is scaled and the output of the ANN is between (0) and (1). How to convert the output back to real numbers, like power, impedance, voltages, currents etc. Hey jason thanks for the turorial. Use pre-processing techniques that give the best model performance. can i do this in prediction problem? Yes, if the largest value ever to be seen is 100K. Without scale and resclae error is big. I was thinking if I don’t sclae and rescale result should be same but not the error is big. What is the difference between rescaling and normalising data? one quick question. Should I standardscaler both input and labels? or only input should work fine. Any difference between them? which one do you recommend? Thanks. For regression, yes this can be a good idea. I recommend testing with and without scaling inputs and outputs to confirm it lifts model skill. Most of the reference articles I have followed used some kind of numeric data in their data set. How do I work with the non numeric data for making a recommendation system. I look forward very eagerly for your help. Thank you in advance. If the data is categorical, you can encode it as integer, one hot encoding or use an embedding. Can you share an example for this which includes the creation of recommendation system also? Thanks for the suggestion, I hope to cover the topic in the future.